Marco Italian Kitchen is a centrally located Italian restaurant situated right at the corner of Gordon St. and the ever-busy Dizengoff Street. Marco’s is an excellent example of a Tel Aviv restaurant doing their best to bring an authentic Italian experience to Israel. The owner Marco and the Chef Gabriel Pinhasov embark on a culinary journey to Italy once a year to experience new dishes and ingredients taking the forefront of Italian cuisine, and then bring it back to their restaurant. 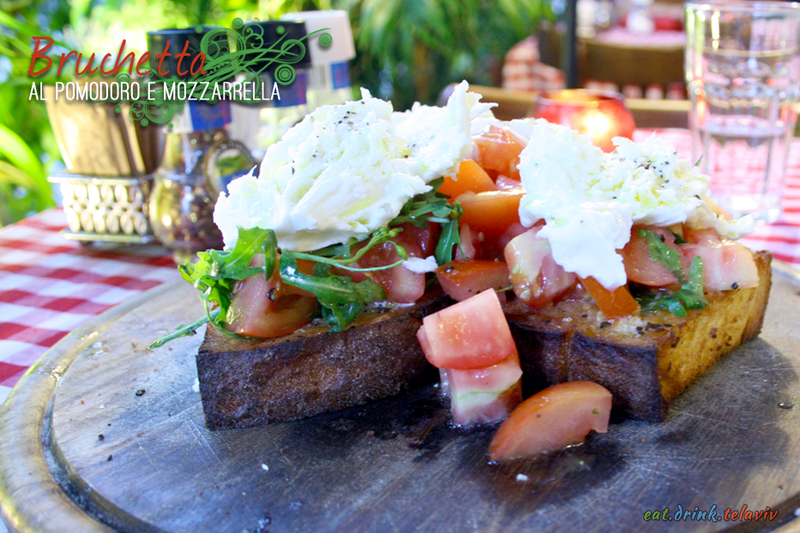 Their Bruschetta al Pomodoro el Mozzarella with their oversized chunks of buffalo mozzarella atop a generous helping of tomatoes all perched on top of olive-oil drenched bread is a direct result from one of those trips. It seems almost impossible to eat, but very easy to enjoy. From the hand-made pastas, pizzas, to the Italian artichokes and Italian sun dried tomatoes, each dish is carefully created to represent Italy at its finest. Their care for genuine Italian fare allowed Marco to be one of three Italian restaurants to receive recognition from the Italian Embassy for culinary excellence. Gentle Italian music plays out to the beautiful patio, the red and white checkered table clothes, lush greenery and soft lights give the seating area a relaxing and charming atmosphere. However, being right at the corner and on Dizengoff expect the proximity to the street to give off that city vibrancy. 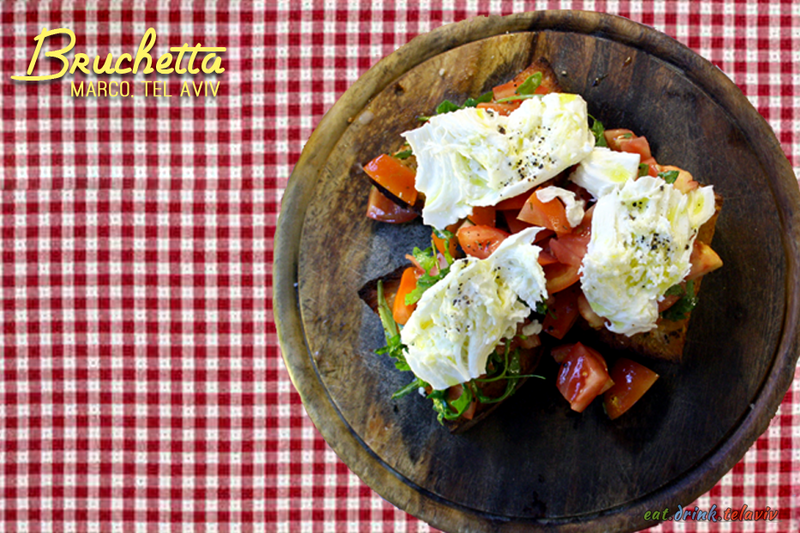 Indulge in incredibly flavourful salads, pasta, large pizzas, and wonderful appetizers like the Bruschetta al Pomodora e Mozzarella (with gluten free options) and feel content that you have dined with Italy in your heart, head and stomach. Marco, Tel Aviv offers some incredibly full flavoured Italian pastas and pizzas it made choosing very difficult. 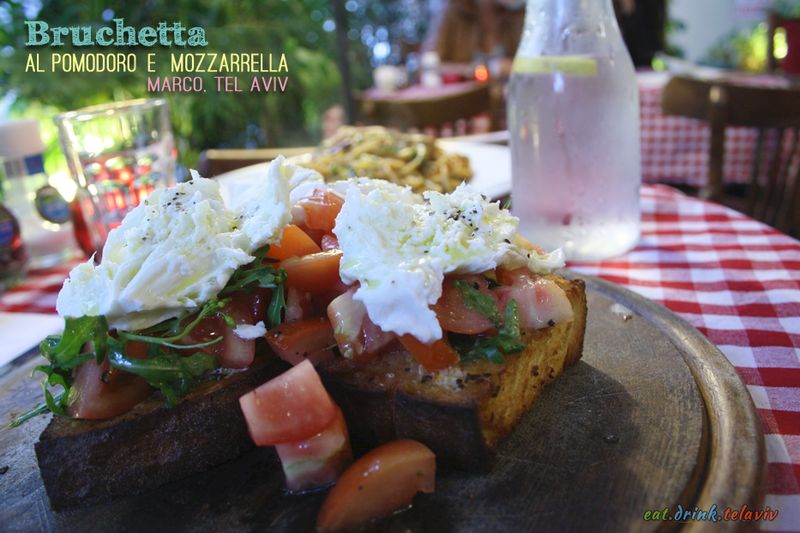 Seeing how Marco is one of a few Italian restaurants in Tel Aviv (and the world) to win a Authenticity and Quality award from the Italian Embassy, it made the choice all the more difficult. We started with the Bruchetta al Pomodoro e Mozzarella, the huge pieces of cheese on top of the rich tomatoes swathed in olive oil. While the presentation and construction is directly from the kitchens of Italy’s finest restaurants, it does seem an almost Herculean feat to get the Titanic sized pieces into your mouth. Save yourself from bathing in olive oil and tomatoes (as wonderful as that may sound) and cut the appetizer up into more manageable pieces. 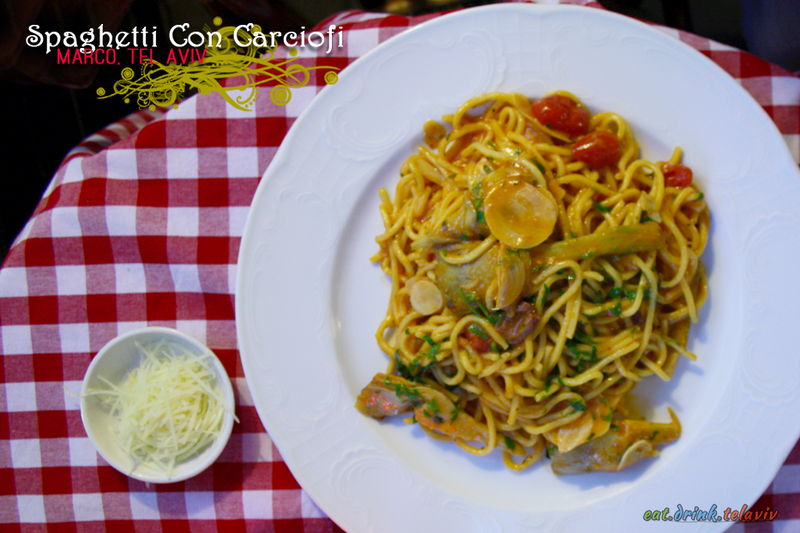 The Spaghetti con Carciofi, was strongly recommended by the waitstaff and manager. I usually avoid spaghetti, having eaten it mostly as a child, and thus I was a little skeptical. The sheer flavour of the dish is overwhelmingly wonderful, bringing the once childhood pasta into full adulthood – the hand made pasta was prepared perfectly, accompanied by a generous (if not perfect) amount of sauce. The thinly shaved garlic was pungent and delicious, and paired well with the Italian artichokes, cherry tomatoes and black olives. It is only at Italian restaurants I have become accustomed to ordering Tiramisu, which I have grown to enjoy over time. 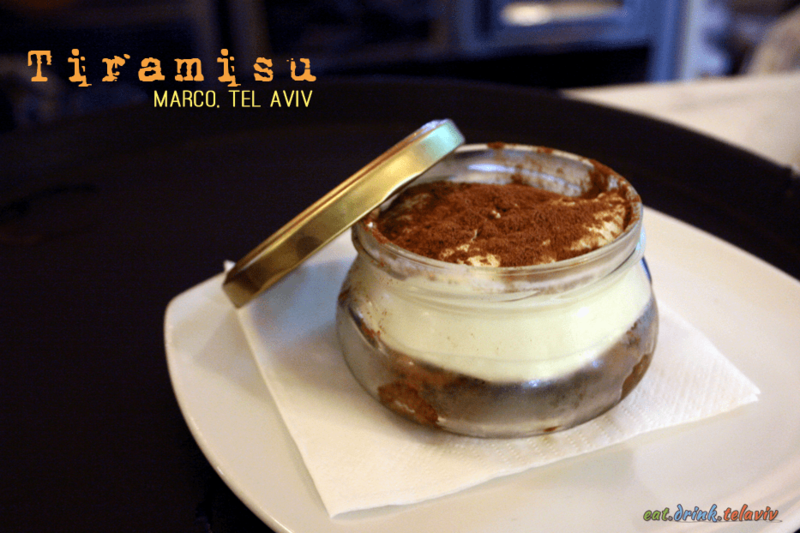 Marco’s tiramisu was a fine dessert (35NIS) but I felt it was not in top form. Kept in a bar fridge the bottom of the dessert was much cooler than the top, with a lot of bitter espresso liquid at the bottom. While that kept the lady fingers moist, the dessert was not consistent throughout. Very creamy and rich, with too much cocoa. While visiting the bar, I could see the bartender prepare the desserts for diners, and she haphazardly and very quickly applied the cocoa to the top of the tiramisu drowning it in brown powder. The restaurant takes such meticulous care with crafting their dishes it is almost a shame they seem to rush this dessert. While I am not a huge fan of tiramisu in a jar (more on that later) with a little patience this dessert can be prepped well, and will delight your sweet tooth. 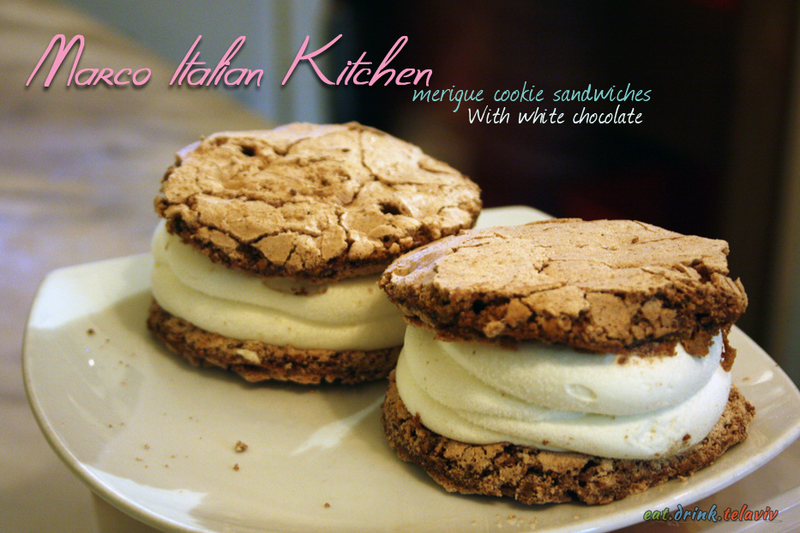 Like these two chocolate merigue cookies with white chocolate. Marco’s location, food and atmosphere serve it well in the Tel Aviv restaurant scene. The authentic Italian cuisine is excellent and aside from the jar-free tiramisu, the overall experience is worthwhile, without having to leave the bustling and energy of Tel Aviv.